Simon Barton won the first prize - a 3 weeks trip in Paris, including 2 weeks of training under the guidance of Thierry Marx and his team at the Mandarin Oriental Hotel, Paris followed by 3 days at the Le Cordon Bleu institute in Paris. 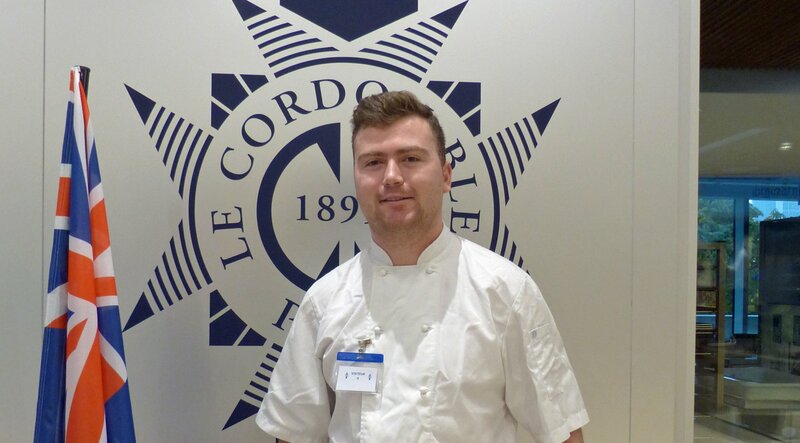 We met with Simon for a quick interview when he arrived at Le Cordon Bleu Paris institute after 2 weeks of training at the Mandarin Oriental Hotel with chef Thierry Marx. An opportunity to ask him some questions about him and his incredible experience in Paris! What brings you here, in Paris? I am Simon Barton. I am finishing my studies in Australia, in Melbourne and I will soon be a chef! I entered a competition back in Australia called the Thierry Marx Career Development Award. I had to present one main course and one dessert, I had an interview and I ended up winning! It was very surprising to me, I thought I was going to enter and that would be it. The award gives you a stage with Thierry Marx for a week and a half and the opportunity to visit Le Cordon Bleu Paris institute which is amazing! . What does French culinary arts represent to you? To me it is the background of cuisine. You need to know French cuisine before you know anything else. Chefs like Auguste Escoffier are the first chefs, they are the pioneers of restaurants and pioneers of food and so you need to understand the history before you move forward and you do things in the future. I think having a French cooking background is very important. And then you can move off and you can do things but as long as you know how the basics and the techniques. I need to know these things before you do anything else. That is very important. I learnt the basics while I studied. I have a background of food because my mother is Croatian but it is very simple and rustic but I did not know much about French cooking. I am not sure yet. Thierry Marx’s food is what I would like to do eventually. Mixing the kind of traditional with the futuristic and you start learning new techniques, you try different things. I think, right now, the smart thing is to work hard, look for opportunities and take them. And try to better yourself as a chef and things will come to you.